(Newser) – The man who invented email—right down to the addition of the @ symbol—died over the weekend. 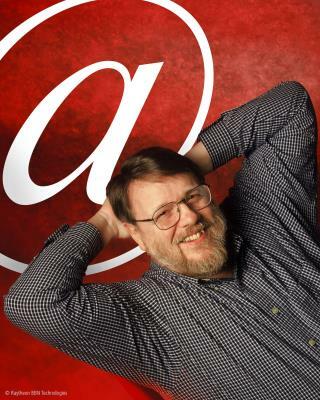 Ray Tomlinson was 74, and heart failure is suspected, Ars Technica reports, From the official Twitter account of Gmail: "Thank you, Ray Tomlinson, for inventing email and putting the @ sign on the map. #RIP." Tomlinson in 1971 wrote the first email program for ARPANET, a precursor to the Internet, while working at Bolt Beranek and Newman (now Raytheon BBN Technologies). He reportedly showed it to a colleague, saying, "Don’t tell anyone! This isn’t what we’re supposed to be working on," the Guardian reports. In one interview, Tomlinson reportedly said he created email "mostly because it seemed like a neat idea." Early email test messages were, he said, "entirely forgettable," and the first email was sent between side-by-side machines. If only he was a humongous douche that skirted the law and abandoned his children. Then he'd have multiple biographical movies about he and he would be treated like a deity.